How do you choose who should make your Oak frame? In a crowded market place, how do you choose who should make you Oak frame building? As a consumer it is always difficult to know how to choose between the different operators in the market. No two quotes are ever the same so comparing like for like is near impossible. Marketing messages on the whole tell you the same thing, that doesn’t help. So perhaps you should look at brand reputation or maybe price…? Brand names can be expensive, maybe reassuring but don’t necessarily mean you’ll get what you think you’ll get be that quality, look or service. Price, well budget should always be respected but choosing on price alone is a bit of a blunt instrument, it tells you nothing of the product you will end up with, the service you’ll receive or the quality and craftsmanship that goes into making the frame. What about value for money?… How much bang for your buck? Value: The idea that for £1 spent you might get 95p of value while another supplier for 80p spent may only give you 60p value, but how can you tell the difference? The difference is found in the detail either by doing a “Rolls Royce” job or cutting corners to increase profit. Skilled framers hand scribe each joint, meaning the imperfect shape on one side of a joint is transcribed to the other, meaning every joint is unique and perfectly fitting for rigidity, strength and durability. This scribing process is not done by most framers and cannot yet be done by a robot. A hand carved mortice and tenon is square or rectangular, which means the joint can resist the natural twisting of a beam as the oak shrinks, keeping the joint structurally sound and square. Robot made frames are quickly produced but can only have rounded M&T joints because the spinning cutters are circular. As the oak shrinks and twists, rounded M&Ts cannot prevent this movement so glass and weather seals break. The skilled framer is also able to limit waste by using his judgement, reading the timber and utilising it to the best advantage. Robots and semi skilled carpenters cannot use judgement, they assume everything is uniform, Oak is many things but never uniform. It is increasingly common to see steel incorporated into joints. For example, using large steel screws instead of a traditional joint. A steel screw will end up spanning a gap as the Oak shrinks. A traditional Oak joint can last for 1000. Screws are useful to locate a joint, but should never be used on their own, no matter how much money you save! 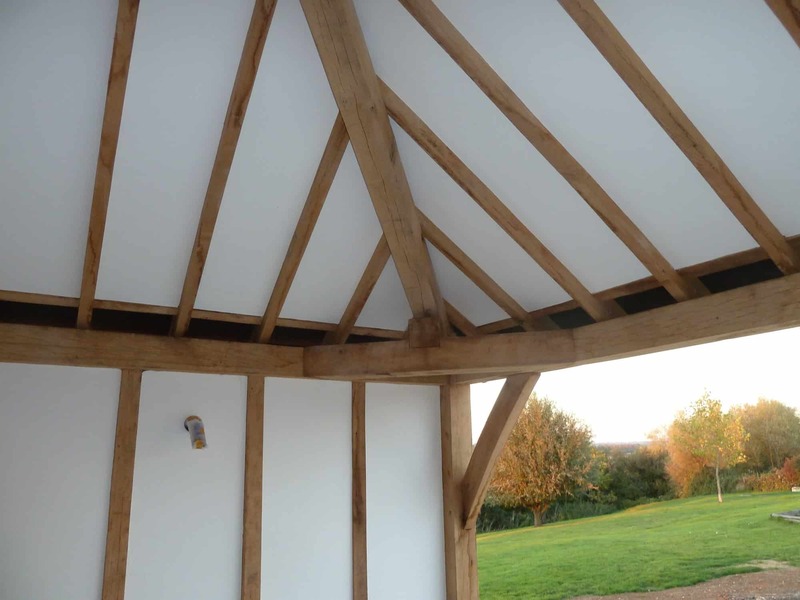 However, it is sometimes appropriate to reduce the level of Oak engineering, for example for feature trusses which are not weight bearing, or carefully considered alternative joint production in order to reduce costs without weakening the integrity of a frame. For example using a metal strap and screws rather than a traditionally hand carved spline joint. Spline joints in purlin runs will pull the joint tight whereas a steel strap can only stop the joint spreading. Timberpride offers an un-compromised frame giving 95p of value for £1 spent. The robots, steel straps and un scribed joints may be cheaper but is 60p value for 80p cost any form of value? Timberpride is committed to using traditional skills to produce our work. Not out of a sense of nostalgia but because our experience tells us that’s the best way to get a finished product we’re all proud of. We produce to order – Our oak frames, floors and cladding are made bespoke in our Cotswold workshop to your exact requirements. Our decades of experience in the oak industry and quality workmanship using traditional techniques means we are a centre of excellence for all things oak.